The Pathfinder Roleplaying Game is an evolution of the 3.5 rules set of the world's oldest fantasy roleplaying game, designed using the feedback of tens of thousands of gamers just like you. Whether you're new to the Pathfinder® universe or you're a seasoned veteran, Pathfinder: Kingmaker® is the CRPG you've been waiting for. To the north lie the Stolen Lands, a region that has been contested territory for centuries. Hundreds of kingdoms have risen and fallen in these lands, and now it is time for you to make your mark—by building your own kingdom! To do so, you'll need to survive the harsh wilderness and the threat of rival nations... as well as threats within your own court. 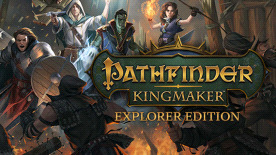 Pathfinder: Kingmaker is based on Paizo's award-winning Pathfinder Adventure Path of the same name. You certainly don't need to be familiar with the story, but if you are, you will encounter characters you know and love as well as a host of brand-new events, companions, allies, and threats that expand and enhance the original Adventure Path. With help from Paizo and their authors, the story and quests have been expanded by RPG writer Chris Avellone and the Owlcat team, allowing for even more adventure in the already rich narrative of the Stolen Lands. While Pathfinder: Kingmaker is a single-player game, you won't be adventuring alone. "Kingmaker" features a diverse cast of companions and NPCs, including iconic characters from the Pathfinder setting itself. You'll need to decide who to trust and who to watch carefully, as each companion has an agenda, alignment, and goals that may differ from yours. Your journey will become their journey, and you'll help shape their lives both in the moment and well into the future. As you'll discover, building a kingdom goes beyond simply building a stronghold: Your kingdom is a reflection of your character and your choices throughout the game. It is a living thing shaped by your alignment, your allies, and your ability to lead your people. Not only can your kingdom expand, opening up new territories and allowing you to build new towns and communities, but your capital city will physically change based on your decisions, your policies, and even whom you choose to ally with. As your kingdom grows, a number of factions and neighboring countries will come to you to seek favor—and to test your strength. Pathfinder and Kingmaker are trademarks and copyrights owned exclusively by Paizo Inc. and used under license. My.com and Owlcat Games Studio are trademarks or registered trademarks of My.com B.V. 2018 published by Deep Silver, a division of Koch Media GmbH, Austria. Deep Silver and its respective logos are trademarks of Koch Media GmbH. This product is based on tools and technologies ©2018, My.com B.V., Owlcat Games Studio. Certain tools and technology also used in this product are © Unity Technologies, 2018, © 2006-2018 Audiokinetic Inc., © 2008-2018 Syrinscape Pty Ltd.